Now The Details: Paris May 1968 = Montreal May 2012? Paris May 1968 = Montreal May 2012? I missed May '68 by a couple of years. May 1968 was when student demonstrations, strikes and violence almost overthrew the French government of Charles De Gaulle. Throughout that month, thousands of students and workers protested against the government and a chaotic education system. I was still an undergraduate in Canada, watching events from afar. Graduate work got me to Paris by 1970 and the smouldering resentment was still palpable, especially on the weekends in the Latin Quarter. 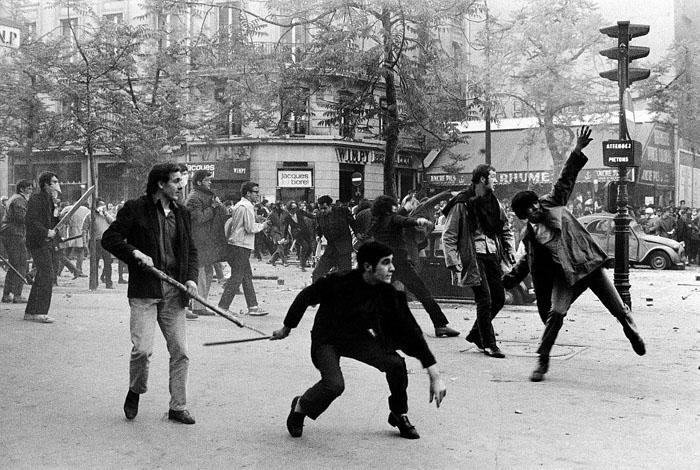 Clashes with les flics were a regular occurrence, even two years after the main event. Thousands of students demonstrate daily against the provincial government and its proposal to raise tuition fees from around $2000 to more than $3000 a year. Even after a 75% hike, Quebec students will still pay the lowest tuition fees in Canada. By way of comparison, Ontario students pay the most - just over $6000. Tuition fee hikes triggered the student protests in Montreal. But like their Parisian counterparts a generation ago, the issue is much broader. It's about the overall purpose of education and the prospects for meaningful work after graduation. Quebec universities have been seriously under-funded while some social programs (aside from education and health care) have been over-funded. Quebec is deeply in debt. Austerity in Quebec is now the watchword from the government. But the students and their allies in the media are saying "Non! ", sometimes violently. More recently, the nightly protests have turned away from burning tires and tear gas. Instead the students march through the streets banging pots and pans with spectators joining in the raucous protest. This has gone on for more than three months and there are signs that public support for the students is starting to fade. The summer tourist season is quickly approaching, and the prospect of fewer visitors to the Montreal Jazz Festival and the local Indy race is causing many Montreal to say "Enough." Here's where the similarity to Paris 1968 occurs. De Gaulle was worried enough about a revolutionary situation that he secretly left Paris to visit the French army base in West Germany, headed by General Jacques Massu who had opposed De Gaulle's withdrawal from Algeria in 1962. Massu promised to support the government with force if necessary, and in return Massu obtained an amnesty for ex-French military rebels opposed to Algerian independence. These rebels called themselves the OAS - l'Organisation de l'Armée Secrète. In the early 1960s, the OAS blew up government buildings and came close to assassinating De Gaulle. With Massu's support in his pocket, De Gaulle returned to Paris and called on the people of France to oppose the striking students and workers. He promised a national election which would act as a referendum on the issue. De Gaulle's appeal worked. The parliamentary left in France - the Socialists and the Communists withdrew their support for the students and the student revolt collapsed. Premier Jean Charest of Quebec has not sought military backing from the Canadian army (as far as we know). This is the most serious political challenge to authority in Canadian history since the FLQ Crisis of October 1970 when martial law was declared in Quebec. Charest has also promised an election to decide the outcome of the dispute. No date has been set. 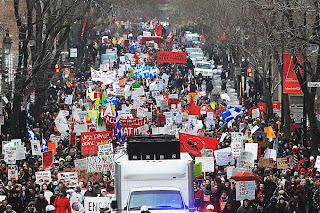 Charest's hardline with the students seems to be working. Public opinion, initially on the side of the students, is shifting back to the government. The opposition party has given only tepid support to the students, and polls show that this has not moved support their way. But the questions raised in 1968 by the students in Paris and now in 2012 Montreal, have still not been answered.